Santa Ana’s Observatory OC (3503 S. Harbor Blvd) will host the massive Dimebash 2019, fueled by Monster Energy, on Thursday, January 24, 2019. The event will be hosted by Sirius XM’s Jose Mangin, and in addition to Monster Energy, is sponsored by Affliction, Metal Blade Records, Dean Guitars, DDrum, California’s Finest and BackBeat BBQ. 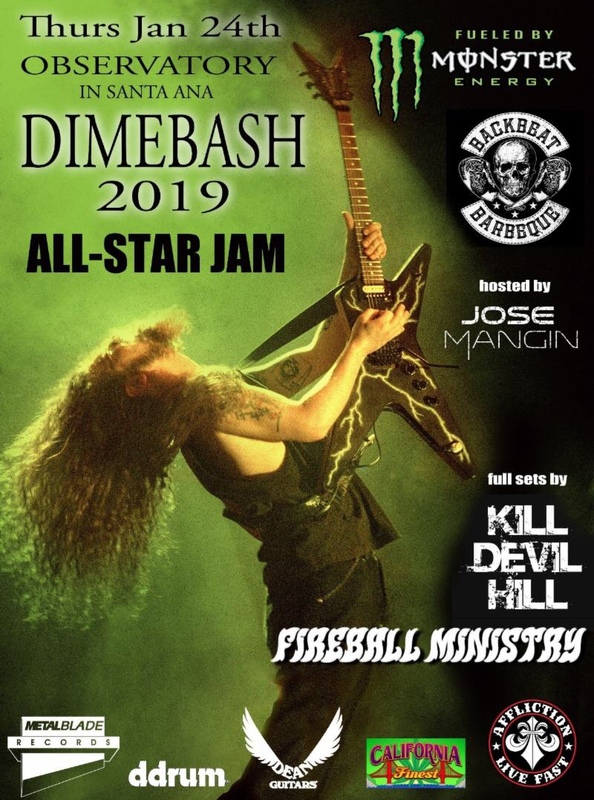 Dimebash will also feature individual performances by Kill Devil Hill and Fireball Ministry. Doors open at 7:00 PM and the all ages event starts at 7:30 PM. Tickets are available now here. Many great raffle prizes will be available to win throughout the night, along with a chance to win a seat at the picnic table at the exclusive Artist’s Afterparty. The private afterparty will take place after the main event, and will feature Dave Grohl’s BackBeat BBQ cooking up a monstrous feast with some acoustic entertainment by Kyng (and maybe another familiar face… or three)!